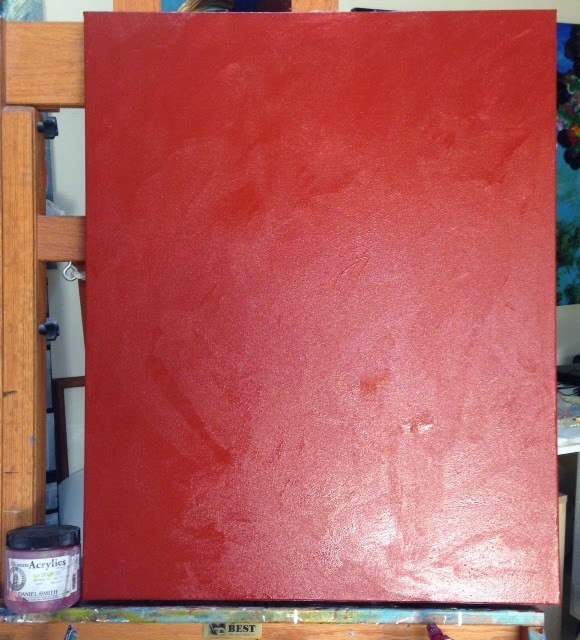 Blank canvas on easel. Beginning a new work. I believe that serendipitous situations have tremendous influence on art. Contemplate this: Last week I opened the January issue of National Geographic to find the lead article titled 'The First Artists' is all about the invention of symbolic expression, what it is and theories about how it came to be. This piece discusses ornamentation of body as well as cave art and amulets created by first humans. This fits nicely with my newest series of work: Hidden Identities. I devoured the article and then re-read it, and though I had already started this third canvas in the series, some of what I read influenced the direction of this painting. Somewhere in the article there was talk about the tools used by the first artists, sticks being a part of those. 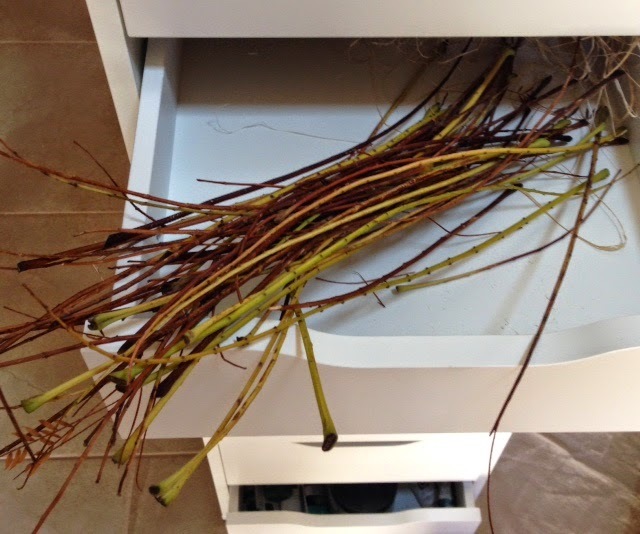 I found myself running out to collect sticks to introduce into the composition which was originally influenced by Aboriginal body decoration. Close up of the sticks on the canvas. Cutting and scoring through the paint to reveal pigments applied earlier. After initial addition of glazing techniques. Unfinished painting on the easel. More work to be done. Though this work nears completion, it is not done. Currently I am painting in a stripe of black through and behind the sticks which was originally intended to be a bold compositional line, however reading the National Geographic article and allowing new thoughts to work their way into the creative process has taken the composition in a little different direction....serendipity! Perhaps this work will be titled: Tools of the Trade.